Free reader for Shop'NCook cookbooks. Search recipes and print recipe cards. 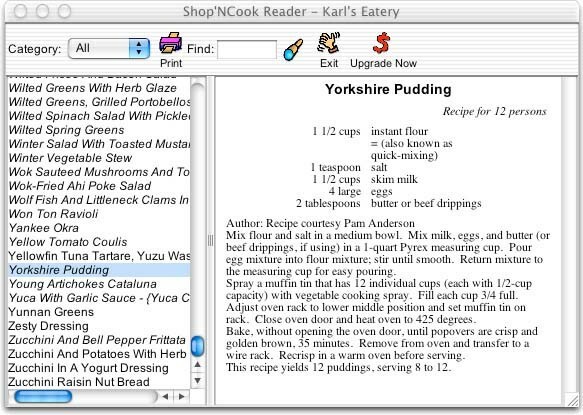 Shop'NCook Cookbook Reader for Mac 3.4 is food & drink software developed by Rufenacht Innovative. 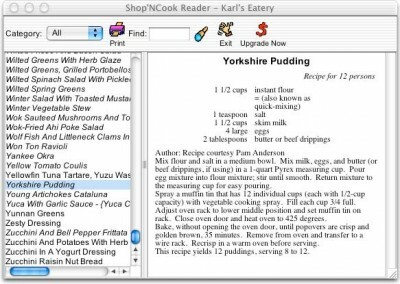 Shop'NCook Cookbook Reader is a free software to read the cookbooks created with Shop'NCook Shopping List & Recipe Manager software. Shop'NCook Cookbook Reader makes it easy to share your cookbooks with friends and family or distribute them over the Internet. With Shop'NCook Reader, you can view and search the recipes and print recipe cards. Free cookbooks totaling thousands of recipes are available for download. This food & drink software is freeware, which means you can download and use Shop'NCook Cookbook Reader for Mac 3.4 absolutely free. There's no need to buy the product. Shop'NCook Cookbook Reader for Mac 3.4 supports English interface languages and works with Mac. Latest Shop'NCook Cookbook Reader for Mac 3.4 does not contain any spyware and/or advertise modules, allowing installing it with no worries concerning valuable information loss. We has completely tested food & drink software Shop'NCook Cookbook Reader for Mac 3.4 many times, written and published the interesting article and uploaded installation file (567K) to our fast server. Downloading Shop'NCook Cookbook Reader for Mac 3.4 will take several seconds if you use fast ADSL connection. The Internet is your cookbook! Easily import recipes, one-click grocery lists! Smart recipe organizer and grocery list manager to facilitate your meal planning and costing. Shop'NCook is a smart recipe organizer combined with a grocery list manager.